These individuals are your children, family members or friends and deserve diverse and enriching opportunities to live, learn and succeed in their community. CHANCES is an open group and welcomes anyone with developmental disabilities–we want you to be part of the FAMILY! M.A.D. Saturday’s are held once a month, usually on the fourth Saturday of each month. The M.A.D. abbreviation stands for Music, Art and Dance. At each of the meetings we try to provide at least two activities and we usually provide a light lunch or snack. All abilities are welcome and we encourage our CHANCES members to bring their siblings and parents so that they can participate in the fun as well! You should be able to find future scheduled meetings posted right here on our calendar. If you have signed up with CHANCES, you should also receive a postcard in the mail, as well as a reminder email, call and/or text. We look forward to seeing you soon at our next M.A.D. Saturday! NOW ACCEPTING BOARD APPLICATIONS! If you are interested in joining our Board, please complete the application and email to contact@chancesofstonecounty.org. Your shopping makes a difference. Do your shopping on Amazon at smile.amazon.com/ch/27-1589319 and Amazon donates to CHANCES of Stone County Inc. It doesn’t cost you any more than usual! UPDATE: We attended the check presentation and received $36,010, thanks to all of your donations and the hard word of our volunteers! The Price Cutter Charity Championship (PCCC) presented by Dr Pepper is a PGA Tour golf tournament on the Web.com Tour. Each year, it’s your chance to see the PGA’s future greats playing to give local kids great futures. The 2018 tournament was their 29th event. Since the tournament began in 1990, it has raised nearly $14.7 million for children’s charities throughout the Ozarks. The event is played at Highland Springs Country Club in Springfield, and is the parent to a myriad of related events hosted throughout the Ozarks. 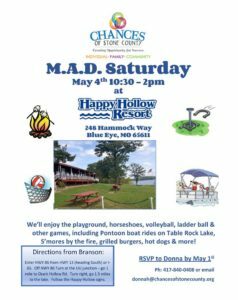 CHANCES has been a part of the PCCC since 2012…this is our fundraising event that helps to make a better future for the developmentally disabled of Stone County. Now, after all the hard work we are ready to find out just how much we have earned this year for our part in these events. We are so excited to attend the Celebration of Sharing presented by The McQueary Family at Highland Springs Country Club on Tuesday, November 27! Thanks to all the wonderful sponsors who have helped make this another successful year! 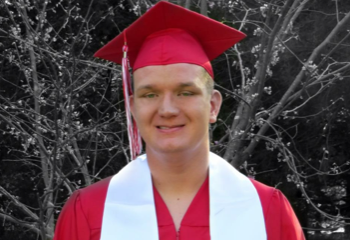 March 31, 2017 Chances has awarded their first Barnabas Prep Scholarship to Adam Gasper of Stone County! Read the article that was posted in the Stone County Gazette’s Thursday March 2nd edition.